THOUSANDS of Queensland boys have passed through the gates of Marist College, Rosalie over more than three quarters of a century. Frank Hartigan was one of the earliest students at the college, founded in 1929. It was the first Marist school in Queensland, and when Frank joined other students in 1931 he studied English, Latin, French as well as physics, chemistry and maths I and II. Records show that since its foundation there have been numerous changes in the operation of Marist Rosalie. The first change took place just over 10 years after foundation when the boarding school moved to Marist College, Ashgrove in 1940. Frank started his education as a Year 4 student along with his twin brother John Joseph. “He went to junior and I went on to senior, finishing in 1939. “It was considered a classic education back in those days. Frank said in the early days the school was famous for its debating, music and sport. “Back in the early days it had a real reputation for amateur boxing. I think it’s more the football now. “One of the other areas we were very good at was music. We had excellent choirs. In 1949 the main school building facing Fernberg Rd was opened and blessed. The La Valla playing fields in Fig Tree Pocket were first used in 1955 and the swimming pool was built on the Rosalie campus in 1965. The college motto “Age Quod Agis”, translates to read, “Whatever you do, do wholeheartedly and well”. The crest features a stylised AM, standing for Ave Maria, surrounded by 12 stars representing the crown of Mary, which is a symbol of the Marist Brothers. The college transferred from parish to archdiocesan administration in 1970. Past student Denis Donaldson was the second generation of Donaldsons to attend the college. He remembers the Fathers’ Club and the work his dad did around the school. “My father Colin was one of the founding students of the college in 1929. When I came here, we had a Fathers’ Club. Mr Donaldson said the college had its share of sacred places. “There is an old boy actually buried at the La Valla fields,” he said. Following the transfer from parish to archdiocesan administration in the 1970s, Years 5 and 6 were discontinued and, in the late 90s the first lay principal was appointed. In 1986 Daniel Crowley became the first Rhodes Scholar from Marist Rosalie. 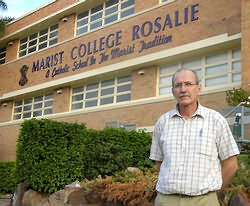 The school’s manual arts co-ordinator Peter McFaydn has spent his entire 27-year teaching career at Marist Rosalie. “I started here straight from university with Br Raymond Mulvogue and Br Harold Carlson. These two men were both true sons of Champagnat,” he said. Mr McFaydn said he would miss the school when it closed. He said the college was epitomised by a saying from past principal Br Mulvogue who headed the school on two occasions. “He used to always say the students were ‘God’s children’. Mr McFaydn said having been at the school for so long he hoped to still be there on the last day.